My first impression of the new Google Chrome web browser is rather good. It is responsive, quick and does not clutter my screen. I especially like how it divides the tabs and tasks into several processes. It's easy to have control on what pages that hogs the power. It will be interesting to see how it behaves during the next few days. You can read more about "Chrome" in the "Google book about Chrome". Well, i must say my enthusiasm has cooled somewhat. I really still like it, but it seems to start churning away on my disk and cpu after some use. Initially it was quick, but now it seems like the tabs lag when opening and switching. I got 2 Gb ram so it should not have been a problem. @iknut - yeah, it's very much made for the future of browsing, i.e. fatter machines with lots of memory and cores. Thirty tabs isn't thirty pages in one browser instance, it's thirty separate browser instances. 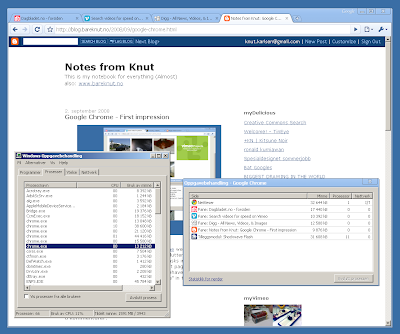 I routinely have 60-100 tabs open in several Firefox 3 windows, for instance.